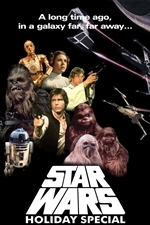 The Star Wars Holiday Special is a 1978 American television film set in the Star Wars galaxy. It stars the film's main cast while introducing the character Boba Fett, who would appear in later films. It is one of the first official Star Wars spin-offs, and was directed by Steve Binder. The show was broadcast in its entirety only once, in the United States, on Friday, November 17, 1978 (the week before Thanksgiving), on the U.S. television network CBS from 8:00 pm to 10:00 pm, Eastern Standard Time (EST), pre-empting Wonder Woman and The Incredible Hulk; and on the Canadian television network CTV from 7:00 pm to 9:00 pm, Eastern Standard Time. It was also broadcast in New Zealand on TVNZ and in Australia on the Seven Network. The program also features many other Star Wars characters, including Luke Skywalker, C-3PO, R2-D2, Darth Vader and Princess Leia (who sings the film's "theme song", set to the music of John Williams' Star Wars theme, near the end). The program includes stock footage from Star Wars, and also features a cartoon produced by Toronto-based Nelvana that officially introduces the bounty hunter Boba Fett. The special is notorious for its extremely negative reception. Anthony Daniels, in a documentary promoting the worldwide tour of Star Wars: In Concert, notes with a laugh that the Star Wars universe includes "The horrible Holiday Special that nobody talks about". Nathan Rabin of the AV Club wrote, "I'm not convinced the special wasn�t ultimately written and directed by a sentient bag of cocaine." George Lucas did not have significant involvement with the film's production, and was reportedly unhappy with the results; however Patty Maloney (who played Lumpy) stated in 2008 that Lucas was sent "dailies" of each day's shooting for approval. David Acomba, a classmate of Lucas at USC film school, had been selected to direct the special, but he chose to leave the project, a decision supported by Lucas. The Star Wars Holiday Special has never been rebroadcast or officially released on home video. It has therefore become something of a cultural legend, due to the "underground" quality of its existence. It has been viewed and distributed in off-air recordings made from its original telecast by fans, which were later adapted to content-sharing websites via the Internet.